Apples seeds and plants were brought to colonial America from the British Isles and Europe. By 1750, many large orchards had been established, not for eating the fruit, but for the production of cider. The drink was so popular that it was known as the national beverage in the early 1800s and could be used as currency on the trading market. Often, Individual trees would be recognized for bearing a tasty apple to eat that was good for culinary purposes. Over time, these trees were reproduced and large orchards of specific varieties were grown. Modern technology and consumer demand has changed the apple trade in many ways over the years and is responsible for the variety found today on grocery shelves. For this recipe, the Granny Smith apple is used, a variety that holds up well during the cooking process. 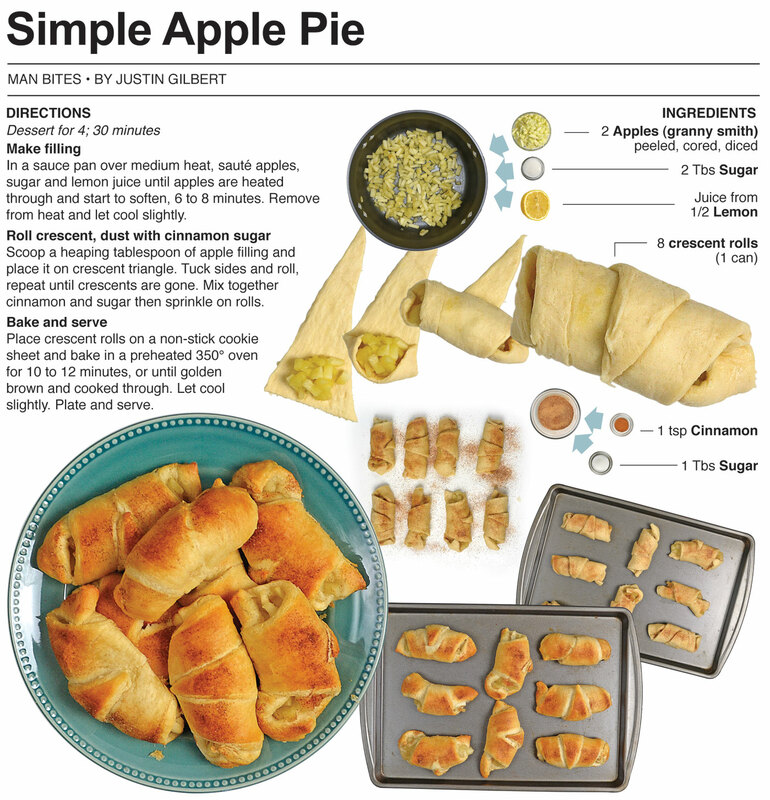 A simple filling is created and wrapped in a crescent roll, then dusted with cinnamon and sugar for a quick and easy apple pie treat. It’s been a long time since I’ve created a dessert here at Behind the Bites. A couple of weeks ago I saw a recipe that called for wrapping an apple wedge in a crescent roll and I thought it was clever. 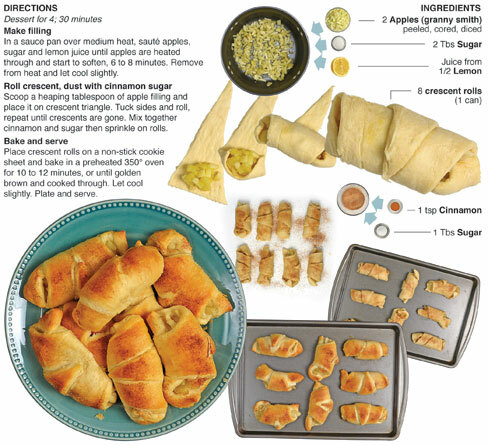 The only problem with wrapping a raw apple wedge in a crescent roll is that the roll will cook much quicker than the wedge. I wanted the apple to be cooked through so it would have more of an apple pie flavor rather than a raw apple slice in dough. I overcame this by dicing and cooking the apple, creating a filling out of it. There are so many directions that this could be taken. I would love to try a caramel drizzle on it or even use canned apple pie filling instead of fresh apples. I went with fresh here because they are in season and for us in Northern Indiana they are everywhere right now. 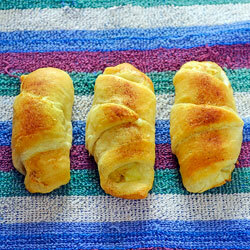 Apples are just one fruit that could be used to roll in crescent dough. Peaches, pears and all sorts of berries would be tasty also. I’m sure that some foodies will see this recipe and scoff because I use dough from a can, but it makes this recipe so simple - any parent could make this treat for the kids and still make it to rehearsal or practice on time after an 8-hour day at work. I would like to make my own dough from scratch but that is a project reserved for Christmas when a couple of days are set aside for making treats. For a weeknight dessert, I think crescent dough from a can is more than adequate, and it’s pretty tasty too. In a sauce pan over medium heat, sauté apples, sugar and lemon juice until apples are heated through and start to soften, 6 to 8 minutes. Remove from heat and let cool slightly. 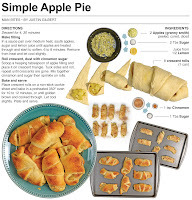 Scoop a heaping tablespoon of apple filling and place it on crescent triangle. Tuck sides and roll, repeat until crescents are gone. Mix together cinnamon and sugar then sprinkle on rolls. 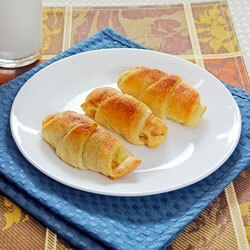 Place crescent rolls on a non-stick cookie sheet and bake in a preheated 350° oven for 10 to 12 minutes, or until golden brown and cooked through. Let cool slightly. Plate and serve. My widsom teeth is growing and I'm craving for an apple pie. Since my gums are acting up, is there a way I could make this recipe softer to chew? Thanks!